What is a cupola and why do barns have them? A cupola is a small tower or dome-like feature projecting from the top of a barn roof. Ranging from large and ornate to small and simple, cupolas typically have three parts: the base, the vents and the cap. The size of the base is determined by the slope or pitch of the barn roof. In the middle, the vents can be windows or slats designed to let light, air or gas pass through. Screens can be added to keep out insects and animals. The caps of cupolas are usually designed to have a square, octagonal, bell-like or other distinctive geometric shape. They are also often topped with a finial or weathervane. Why do barns need cupolas? As noted by Thomas Durant Visser in his excellent Field Guide to New England Barns and Farm Buildings, to reduce the amount of feed required by the animals during the winter, some farmers recommended that barns should be built with battens nailed over the cracks between the sheathing boards to reduce drafts, while others covered their barn walls with wooden shingles or clapboards. But farmers soon found that tight barns could lead to problems. As one farmer observed in 1852: The breath from cattle, together with the vapor arising from the manure, which defies all attempts to keep it below the floor if the cellar is warm, covers, not only the floor over the cellar, but the beams, and the whole underside of the roof, with pearly trickling drops for weeks together during the winter. If the doors are thrown open in order to evaporate this moisture, you lose the benefits you have been seeking in making a tight barn, by reducing the temperature so much that cattle require more food, while the effect is to reduce the flow of milk in the cows. . . . Many large and valuable barns have been very much damaged by being placed over a manure cellar without proper ventilation. To remedy this problem, farmers began installing ventilators, known in New England as cupolas, over an opening left in the center of the top of the barn. The first ventilators were simple wooden louvered boxes with gable roofs, mounted near the ridge of the barn. 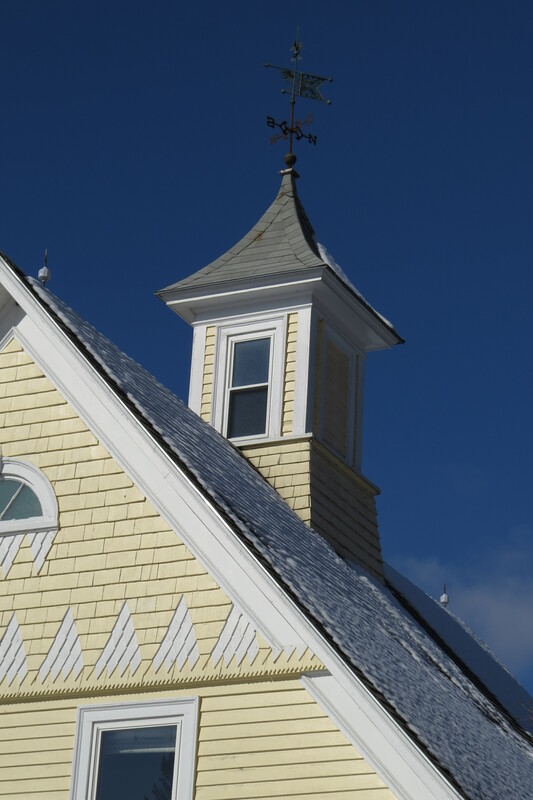 Several of our Madison barns have more ornate cupolas. Note the fancy shingle patterns on the Samuel Gilman barn built by Zantford Savary in 1903. The primary reason barns had cupolas was to ventilate the drying hay. Spontaneous combustion was a constant threat. As a young boy, I visited a family in Maine who had a daughter exactly my age. Late in the afternoon, the girl and I found ourselves playing together in the hayloft where we both became aware of exactly where we placed our hands. Certain spots in the hay were quite hot. Lest you think this a fevered memory, the following quote from http://www.firehouse.com/forums/t107643/ has a good take on the affair. “Wet hay favors the growth of organisms which generate heat and can increase hay temperatures up to 150 degrees F. Once hay heats beyond this point, chemical reactions take over and can increase temperatures to the point of spontaneous combustion. With “wet” hay packed tightly in bales and stacked together in large quantities, fires are very possible. Whether hay which is in this situation actually starts to burn or not depends mostly on the size of the stack and the material surrounding it. Thanks for the additional information, Peter. It’s interesting that most of the old barns in Madison do not have cupolas. Probably because these older barns are not as tight and let in more air through the sides, which kept the hay cooler. I have never been so entertained while learning about hay combustion as I just did. “Fevered memory”? You’re awesome. Don’t stop. Amen to that! Fascinating, I was looking up the word cupola for my chicken coop and voila! I’m looking for advice on whether the vents in the cupola should have the ability to be closed in the winter so not all of the heat escapes. I can see the value in the summer to have them open. We have built a new horse barn and will be building the cupola soon. Any information will help. Many thanks. I have a modern barn and I am debating whether or not to add a cupola on it when I replace its roof. I hadn’t ever thought about a cupola’s function in keeping hay dry or reducing moisture levels when animals are shut in the barn during bad wither weather. That line of thinking have tipped the scales in favor of installing a cupola, though it will set me back a few hundred dollars. Go for it. It’s better to have one and not need it than not have one and need it. 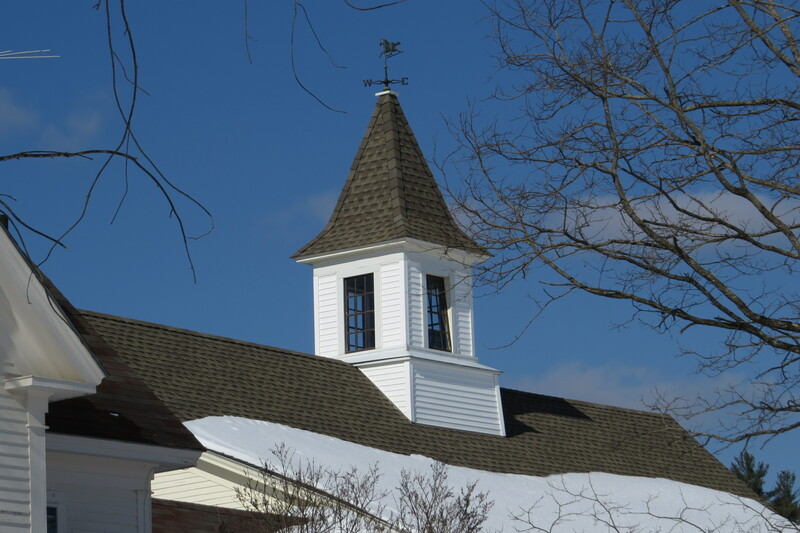 Besides, cupolas are a good bang for their buck when it comes to adding character and style to a design. Sometimes it makes the difference between “a barn” and “the barn”. Best of luck! When I was a young lad living with my family on a farm,one winter my dad noticed that the hay in the loft was very warm. He found out that the damp hay was getting hot when he dug into the mow. Fire was possible if he didn’t solve the problem immediatly. So to solve it and save our barn , he dug deep holes in the hay and buried old dry cedar posts vertically into it hoping they would absorb the moisture and vent the hay at the same time..wah-lah ….problem solved., barn saved……(our barn was old and very ventilated but apparently not enough) My pop was a genius…loved him. Wow, what an education I just got when wondering what cupolas were actually used for! Ventilation, I figured.. I’m an Interior Designer from NC & just bought a cheap mini farm with a dilapidated old barn, but with good bones! It is HUGE, with about a 6″ thick concrete poured floor in the entire thing & an awesome loft. That concrete slab would cost a fortune these days. Thanks for the lesson & for the eloquent monologue too! Ha! Very nice! I just came across this website while trying to find out the purpose of those small round galvanized barn ridge/gable caps, as I have a couple. It’s curious how the object your describing came to be called a “cupola”. Cupola originally was the term for a dome, as on a church, and is still used that way in many countries. The word means, among other things, “cup” in Latin: A dome is an inverted cup. The object you’re describing here should be called a “lantern” if it lets in light, or a belvedere if it’s large enough to allow a person to look out from inside of it. I believe that calling these “lanterns” cupolas in probably an primarily an American usage.